Benjamin Disraeli, 1st Earl of Beaconsfield, KG, PC, FRS, was a British Prime Minister, parliamentarian, Conservative statesman and literary figure. Starting from comparatively humble origins, he served in government for three decades, twice as Prime Minister of the United Kingdom. Although his father had him baptised to Anglicanism at age 12, he was nonetheless Britain's first and thus far only Prime Minister who was born into a Jewish family�originally from Italy. He played an instrumental role in the creation of the modern Conservative Party after the Corn Laws schism of 1846. Although a major figure in the protectionist wing of the Conservative Party after 1844, Disraeli's relations with the other leading figures in the party, particularly Lord Derby, the overall leader, were often strained. Not until the 1860s would Derby and Disraeli be on easy terms, and the latter's succession of the former assured. From 1852 onwards, Disraeli's career would also be marked by his often intense rivalry with William Ewart Gladstone, who eventually rose to become leader of the Liberal Party. 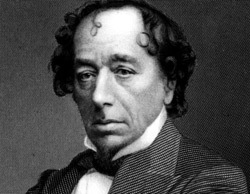 In this feud, Disraeli was aided by his warm friendship with Queen Victoria, who came to detest Gladstone during the latter's first premiership in the 1870s. In 1876 Disraeli was raised to the peerage as the Earl of Beaconsfield, capping nearly four decades in the House of Commons. Before and during his political career, Disraeli was well known as a literary and social figure, although his novels are not generally regarded as a part of the Victorian literary canon. He mainly wrote romances, of which Sybil and Vivian Grey are perhaps the best-known today. He is exceptional among British Prime Ministers for having gained equal social and political renown. He was twice successful as the Glasgow University Conservative Association's candidate for Rector of the University, holding the post for two full terms between 1871 and 1877.